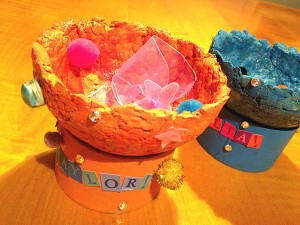 Kids crafts are actually a three-dimensional form of art. It is a very hands-on experience for a child and a great form of personal expression. As a parent, one of the best activities you can provide and encourage is arts and crafts for kids. By fostering creativity in your child you are helping him socially, mentally and emotionally. Working with art and craft materials is stimulating, both visually and mentally. The process of creating art through kids crafts can increase your child’s ability to analyze and problem solve. It is also a great esteem booster as a child creates his own piece of art from a selection of materials into a colorful craft creation. You can encourage creativity with crafts for your kids by following a few simple suggestions. Let kids experiment in their own way. Try not to give direction. Let your child explain his concept. 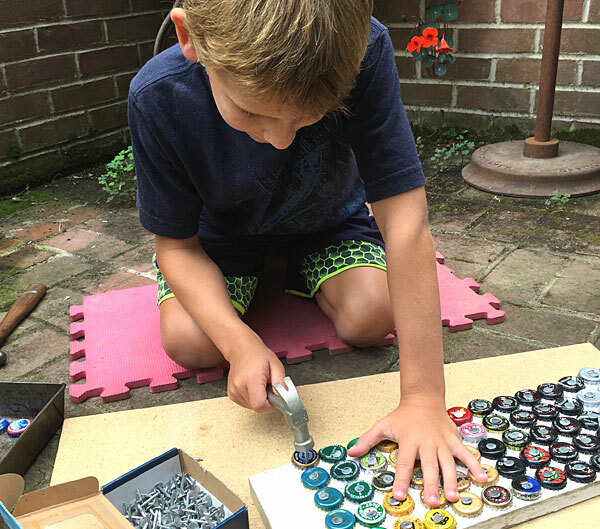 You don’t need fancy materials for kids to create a craft project. As you have probably experienced, kids are good at innovating with just a cardboard box. We do suggest keeping a crafts box with basic art supplies, such as pencils, paper, paint, scissors and other crafty items. This encourages spur of the moment art and craft play. Experimentation with craft materials inspires kids to invent and think outside of the box. Paper is one of the least expensive and most accessible materials for creating easy crafts for kids. Crafts projects can be made from plain white paper, colored paper, cardstock or cardboard. 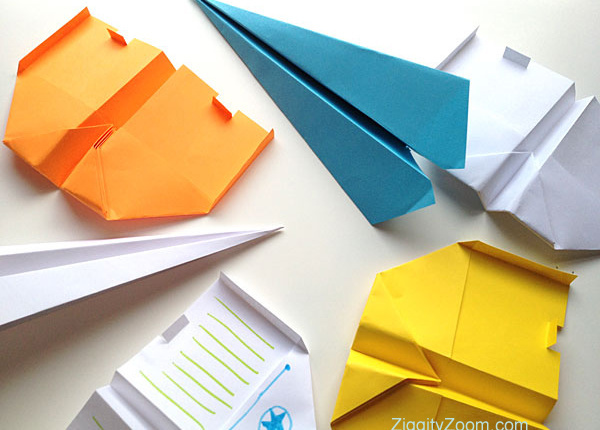 Check out some of our favorite craft projects for kids using paper or cardboard. One of our most popular paper crafts for kids is this exciting photo tutorial to make one of the best gliding paper planes. Kids, and parents too, love good old-fashioned fun. Play doesn’t need fancy toys and gadgets and paper will do just fine. 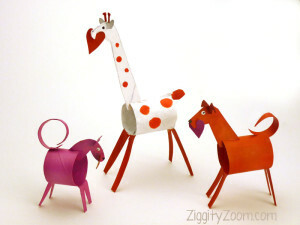 Shown here are the Valentine paper animals we made, which is an easy craft for kids. Using only recycled paper tubes from paper towels and a bit of cardboard, these little animals are fun to make and play with. Kids enjoy making up their own characters and painting them whimsical colors. It’s a fun arts and crafts project for kids to make at home or in the classroom. What kid doesn’t love working with clay? This is probably a number one favorite material for kids to work with when we are doing kids crafts. Considering that clay can be squashed, rolled or formed, it is an extremely fun and tactile material option. Clay selections include air-dry clay, oven-bake clay and clay that can be fired in a kiln. We often take advantage of the many different clay recipes that you can make in the kitchen. When using recycled materials, you are not only teaching reuse but also a respect for the environment. By far, some of our favorite craft projects are made from recycled items. Things kids can use for craft ideas include, boxes, milk cartons, lids, string, unmatched socks, newspaper and more. 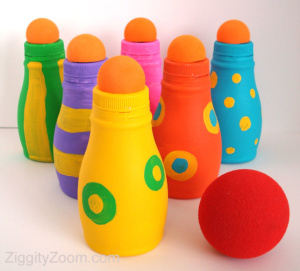 This is a fun and easy game to make using only recycled plastic bottles, paint and a ball. 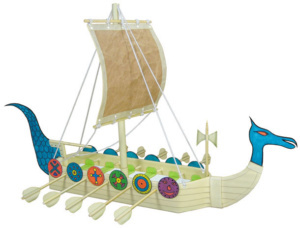 Made from household items, this fantastic Viking Ship is a real show stopper. It’s a terrific project to make and display in any child’s room. 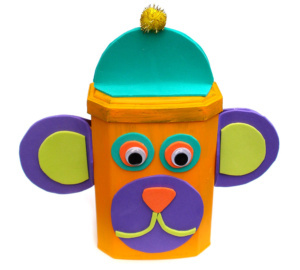 Recycle a plastic container, with a lid, into a fun and colorful bank. We made ours into a monkey, but you could just as easily make a cat, dog or elephant. Sticks, stones, leaves, pine cones … these can all be utilized for craft ideas for kids. With nature crafts, part of the fun is in the actual collecting on nature walks or backyard searches. Nature crafts come to mind when searching for a fall craft idea. Soft fabric crafts are any type of crafts utilizing fabric. 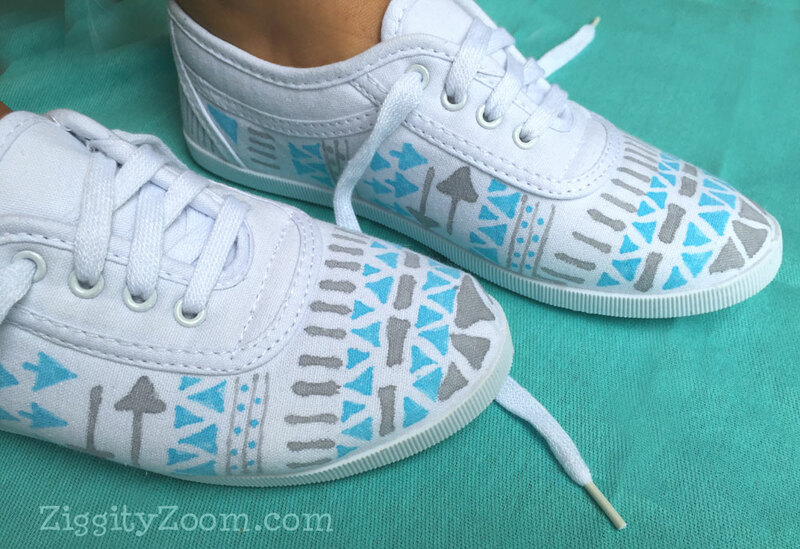 Three of our favorite craft ideas for kids involve shirts and shoes. The craft projects like these are primarily more girl-friendly, but truthfully everyone in the family can make these and boys can do some awesome design work. I can’t begin to tell you how much fun the kids, both boys and girls, had doing this craft project. 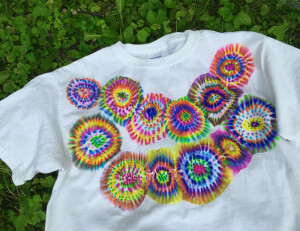 And each and every shirt looked so unique. Best of all, shirts can be purchased at craft stores for just a few bucks. This is by far one of the most popular craft ideas for kids. Our kids and grandkids loved designing their own canvas shoes and the fun color combinations they created were awesome. The bright colors made their designs are a real standout fashion statement. The girls, in particular, can’t wait to wear theirs for school. Many crafts for kids can be made with different types of foam available from craft stores and dollar stores. There are thin, colored sheets of foam, thick sheets of foam and foam pool noodles that work well when creating kids crafts. The craft ideas are endless and this material lends itself to lots of exploration. 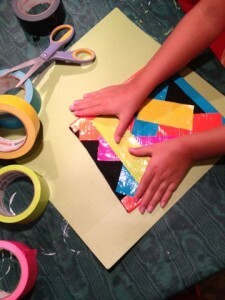 Duct tape is very popular for some of our easy kids craft projects. So popular that we suggest buying this at the dollar store. 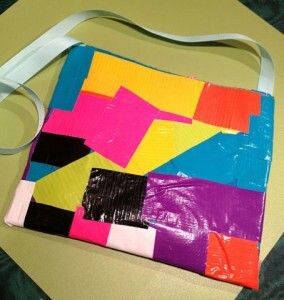 Kids get really creative when you bring out the duct tape! Kids love this easy craft project. It’s perfect for making gifts to give to friends and then they can share the duct tape project how-to with all their friends too. 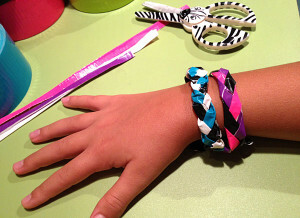 A simple craft project for kids especially suited for girls. However, the boys enjoyed making duct tape wallets and one never seemed to be enough. 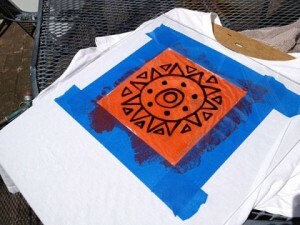 Many fun crafts for kids are actually ones that also work well for kids camp projects. But these easy crafts can be done at home in the backyard to simulate that camp environment. Most craft projects can be completed in an hour or two. 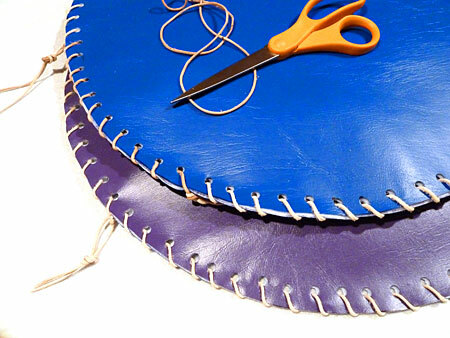 Perfect for sitting around a backyard campfire or at kids camp, this craft project is both fun and useful. Store the situpon for year after year use of camp time fun. Camp is the perfect place to go rock hunting. 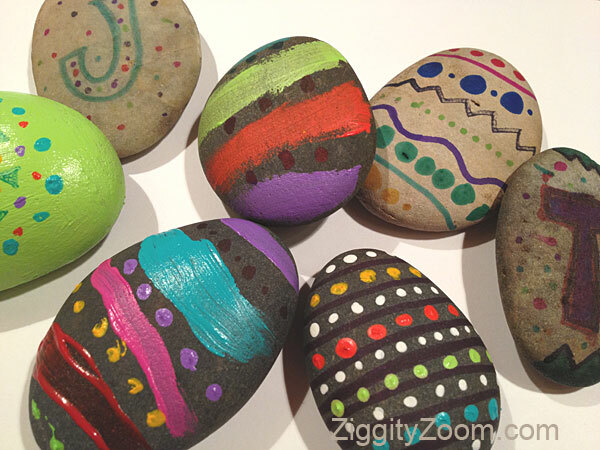 We can think of tons of things to do with rocks but one of our favorite rock activities is to paint them. You can make rock paper weights, fun designs on rocks to display in a bowl or even make a rock family to resemble the people in your own family. 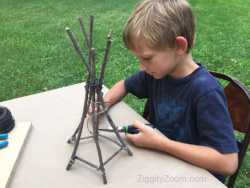 This little twig teepee is just one example of a creative project you can make using twigs or small branches. Even if the kids just bring home twigs or stones from their camping adventure, what a great remembrance from that chunk of childhood time. On summer days when kids are looking for things to do, there are lots of fun and easy crafts for kids. Kids parties are a perfect time to get kids and their friends involved in making fun craft projects. 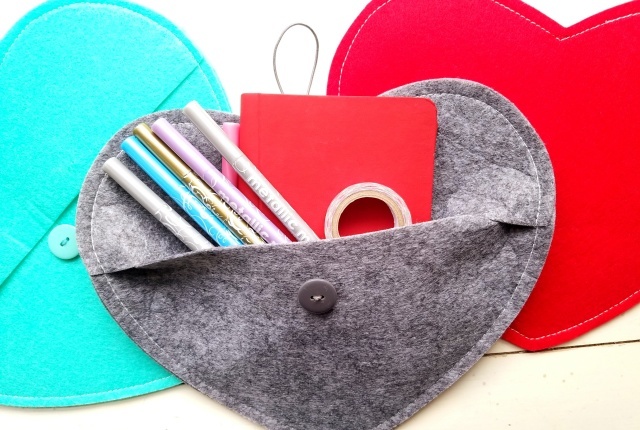 The crafts are more planned with specific materials and maybe a sample easy project the kids can complete in about 30 minutes. These can be themed projects to go along with the party theme or a general craft for kids. Think animals, pirates, mermaids and minecraft. Each holiday offers many opportunities for making themed craft projects. 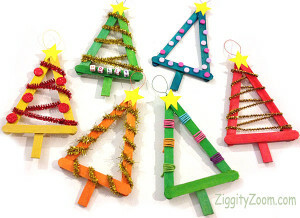 There are crafts for kids that can also be made with gift-giving in mind. Holiday craft projects abound for Valentine’s Day, St. Patrick’s, Easter, Halloween and Christmas. Fun patriotic craft projects, simple enough for kids to make, are perfect for the 4th of July. This fantastic little holiday village is made from recycled boxes, paint and glitter. 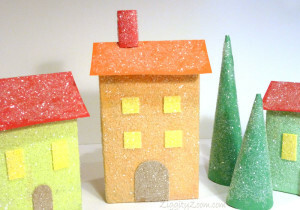 Kids absolutely love any craft project using glitter. You can start the kids off on their village with just one or two building and then they can add to it every year. Popsicle sticks are the basis for this kids craft project. You can get already colored sticks at any craft store and they come in a variety of sizes. It’s a simple but fun project and the kids can make these as teacher gifts or little gifts to give to favorite family relatives. 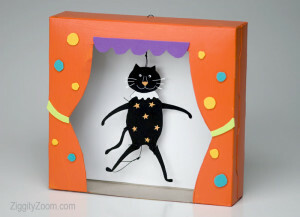 Make this adorable little cardboard theatre for any holiday or just for general play. Kids can design their own characters to make as little jumping jacks. We chose a cute black cat to be our Halloween character for this little theatre. You can make your own craft materials for the kids to use, particularly for clay sculpting projects. There are numerous recipes for clay and most ingredients can be found right in your kitchen. One of the most popular craft activities on the internet. 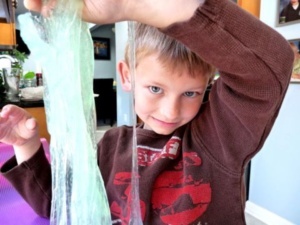 Kids love making slime and it is really easy to make with our two ingredient recipe. Our favorite sidewalk chalk recipe comes from Oh My Handmade. It’s a simple text tutorial with photos and a great activity just making the chalk. Perfect for a rainy day craft. Then use the chalk on your next sunny day. 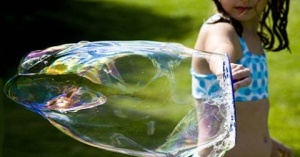 Kids of all ages love blowing bubbles and this is one of our family’s favorite outdoor activities. Whether you are looking for a backyard activity or something to do at the park, this is fun for the entire family, regardless of ages.